The EB-45 Pressure Regulator features a half cartridge design that offers both the performance of a high end, cartridge based valve and the price of a traditional regulator. The EB-45 comes factory set at 45 psi. The pressure may be adjusted to 10-70 psi. The EB-45's half cartridge based system allows for easy servicing and installation. Available in threaded or sweat and Lead Free*. Inlet Blanking kits (3/4", 1", 1-1/4"size) also available. 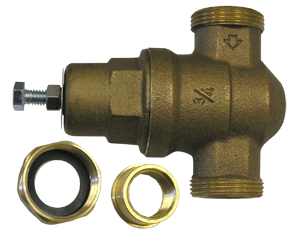 A connection for pressure gauge is available for 3/4" and 1" models.